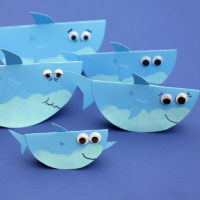 Let’s make a mobile! 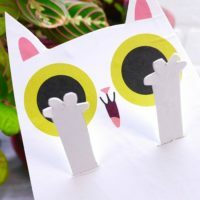 Mobiles are a beautiful addition to a child’s bedroom, and this one is lots of fun to make! 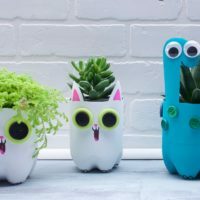 This is a great project to do with your little one. There are a number of steps that will be for grown ups only, but there are lots of fun parts for the kids to get involved with. 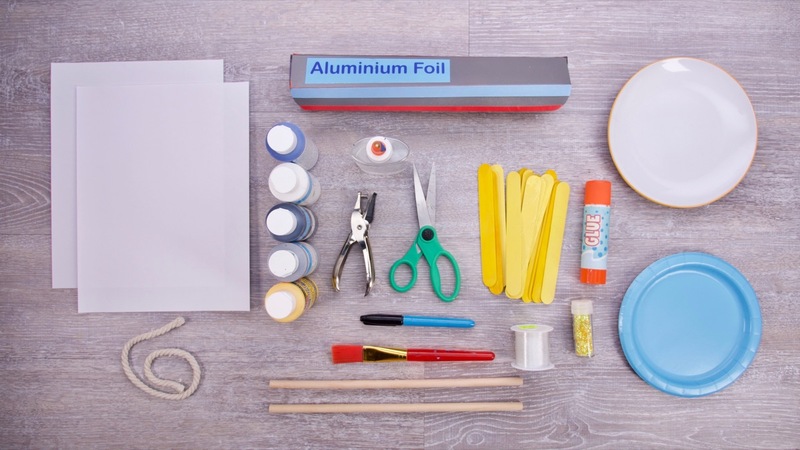 They will enjoy painting with their tin foil ball stamps, and mixing the paints to make different gradients is a great teaching moment. 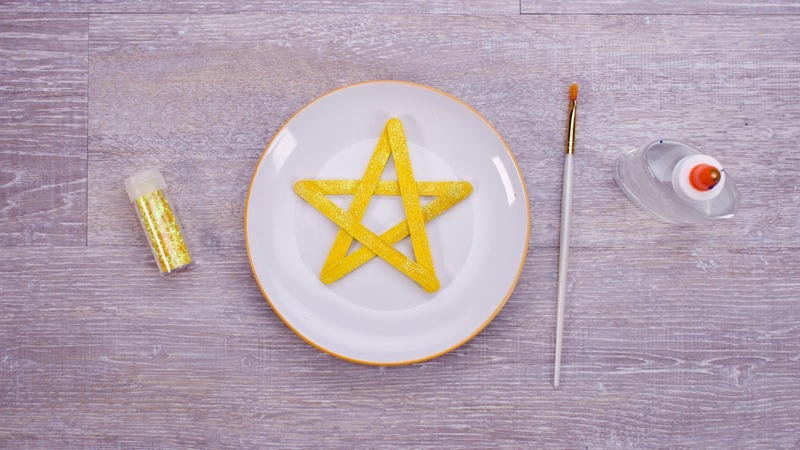 They can also help paint the popsicle sticks and sprinkle the glitter on the stars! 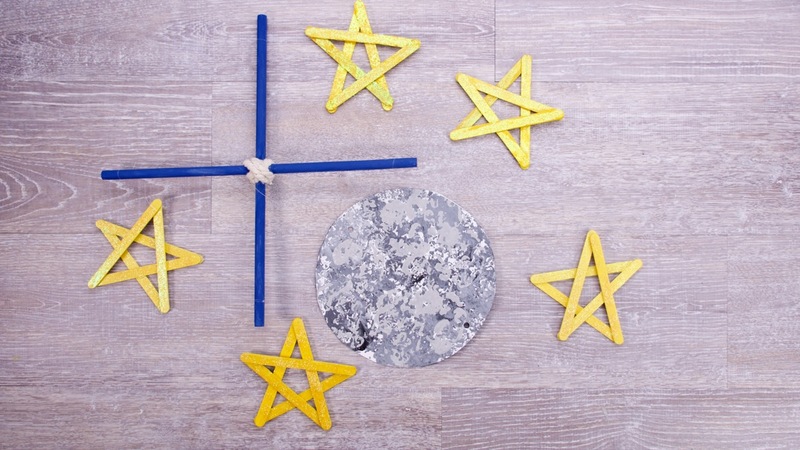 If the mobile is too tricky, try making just the moon and stars. You can hang them directly on the wall, or place them on a paper background to make a little piece of the night sky. 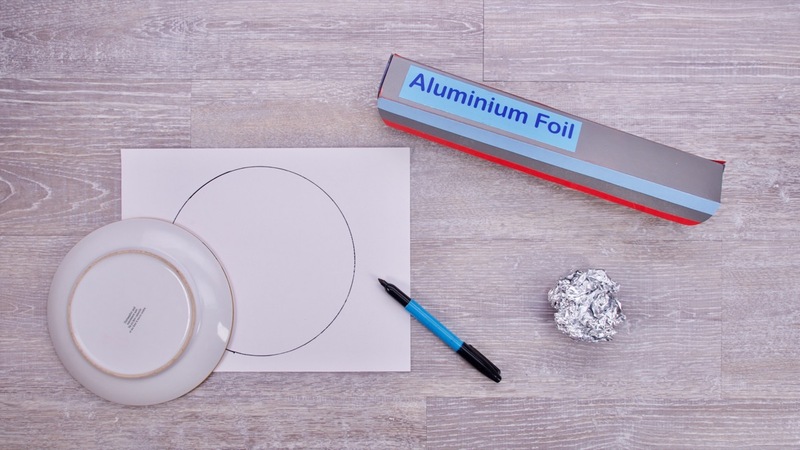 Crumple and form a small ball out of aluminium foil. Flatten the ball lightly by pressing the ball with a plate. With a marker, trace the plate onto two sheets of white paper. 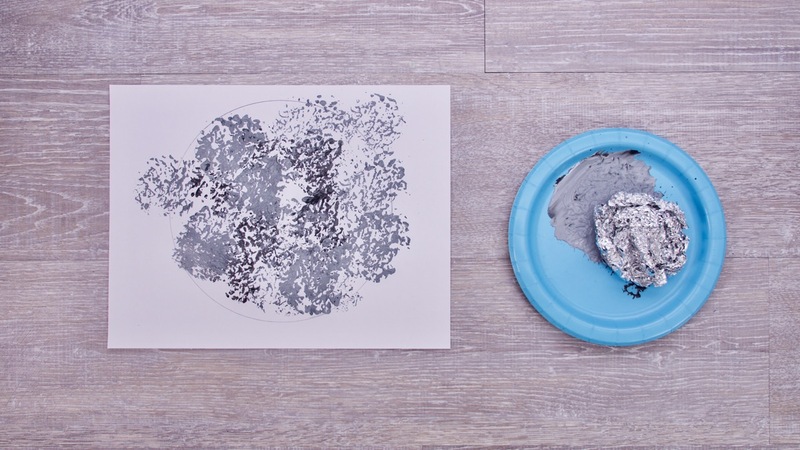 Squeeze craft paint onto a disposable plate starting with dark grey. You can create more texture by stamping different color tones; working from dark to light. Mix black paint to darken the grey paint and add white paint to the grey to lighten. Stamp away! It’s okay if you pass the lines of the circle. Leave your moons to dry then cut out both circles. Glue both moons together with a glue stick. Paint 25 popsicle sticks yellow and leave to dry. This will make 5 stars. 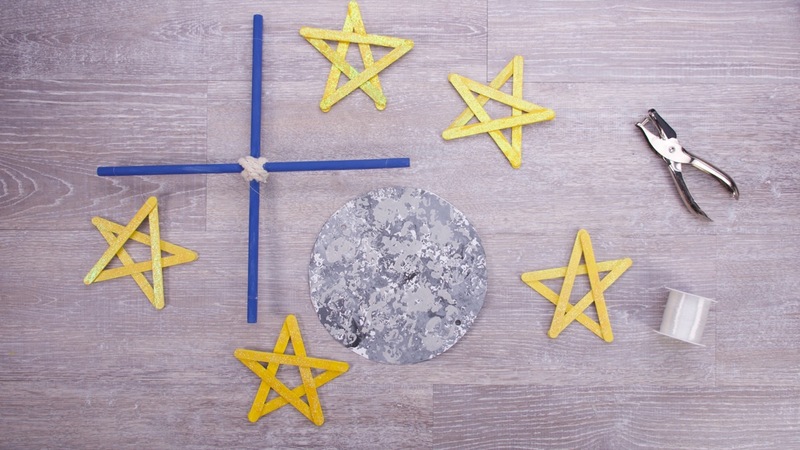 Lay out 5 popsicle sticks in the shape of a star. Lay the popsicle sticks in the same order as you would draw a star, starting from the bottom left corner. Note: This order is important so that the sticks have the best contact to each other for gluing. Once in place, add a bit of white glue on the ends to stick together. Leave to dry. Decorate your stars if you like by painting on clear glue and sprinkling glitter. tie two dowels into a cross shape. You can use yarn to wrap around the joint to join the two pieces together. Punch a hole in both the top and bottom of the moon, to make the hole you can use a hole punch or pierce a hole with a push pin. Attach a length of string to the top and bottom of your cross shape – one for hanging the mobile, and one to attach your moon. 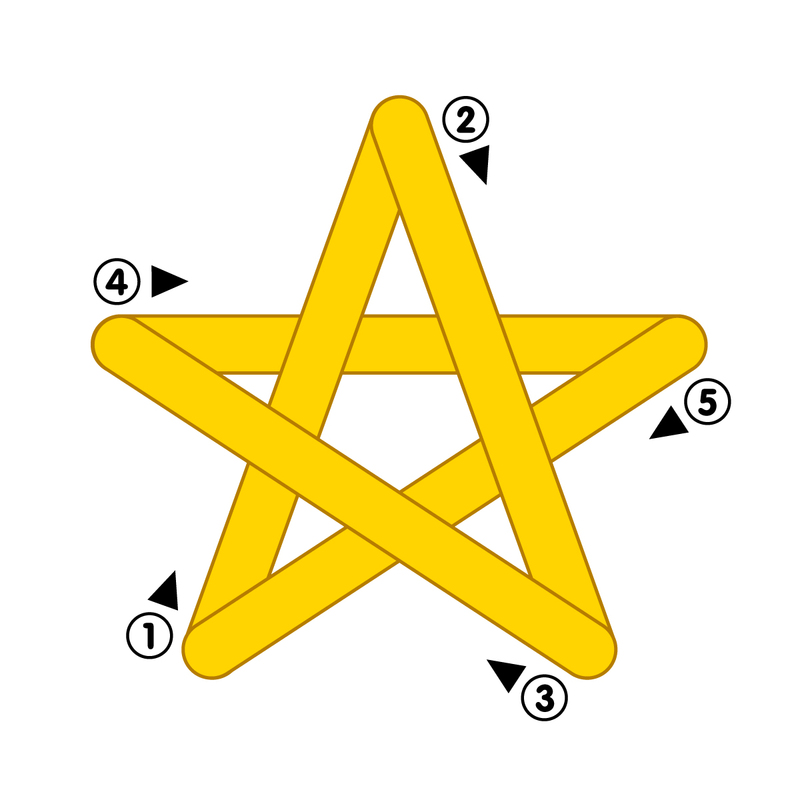 Tie a length of nylon string to each star. Attach the moon into place to hang from the center of the cross and add star hanging below. Hang a star on each tip of the dowels, space them out evenly so the mobile is well balanced and spins smoothly. Original content © 2019 Super Simple. Not to be reprinted without express written permission. Terms and Conditions.